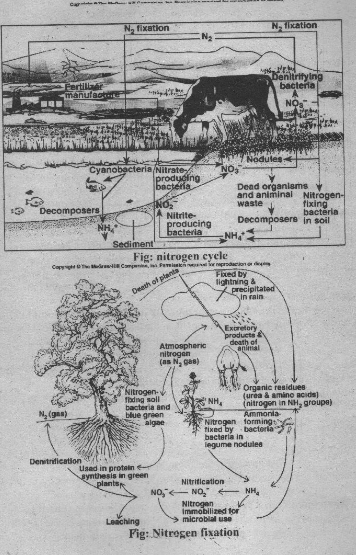 The process by which limited amount of nitrogen is circulated and re-circulated throughout the world of living organisms is known as the nitrogen cycle. The chief reservoir of nitrogen is the atmosphere. Nitrogen makes up 78 percent of the gases in atmosphere. Most living things cannot use atmospheric nitrogen. They cannot make amino acid and other nitrogen containing compounds from this nitrogen. They are dependent on nitrogen present in soil minerals. The shortage of nitrogen in the soil is the major limiting factor in plant growth. The living organism obtains nitrogen by two methods: Nitrogen fixation and decomposition. Asymbiotic nitrogen fixation: The free living nitrogen fixing organisms are called asymbiotic organisms. There are following organisms which fix the atmospheric nitrogen: bacteria, anaerobic bacteria, blue green algae (cyanobacteria) and lichens. The example of anaerobic bacteria is Clostridium and the example of aerobic bacteria is Azotobacter. The example of blue green algae is anabaena. Symbiotic Nitrogen Fixation: It is the most important method of nitrogen fixation. These are of two types: Fungi (Actinomycetes) and Nodule forming Rhizobium species. Some fungi develop mycorrhizal association and fix atmospheric nitrogen. Similarly. some bacteria live in the nodule of the leguminous plants like bean, pea and gram. They fix atmospheric nitrogen. protein, amino acids into ‘ammonia with the help of micro­organism like fungi and bacteria is called ammonification. Soil contains many organic materials in the form of complex organic compounds like protein, amino, acids, nucleic acid and nucleotides. Most of the nitrogen formed in the soil by the decomposition of these organic compounds. 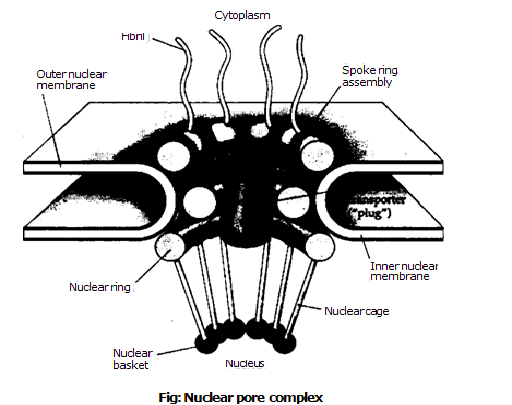 Bacteria and fungi decompose these nitrogenous compounds in to simple compounds. These micro-organisms use the proteins and amino acids and release excess of ammonia (NH; or ammonium ions (NH, ). This process is known as ammonification. Nitrification: Several bacteria in soil oxidize ammonia or ammonium ions in to nitrates. This oxidation is known as nitrification. Assimilation: The absorption and utilization of ammonia or nitrates by the plant is called assimilation. The plants can –utilize ammonium directly. But most of the nitrogen moves from the soil into the roots in the form of nitrate. The nitrates are reduced back to ammonium in plant. This assimilation process requires energy. These aimmonium ions finally transferred to carbon containing compounds. These compounds produce amino acids and other nitrogenous organic compounds. There. are two sources of loss of nitrogen. (a) Leaching: Nitrates is soluble in water. So it is leached out of the soil by rain water. It is driven into the ground water streams, lakes and into the oceans. Some of it is utilized by algae. But some nitrogen is lost into the deep sediments and become part of the rock. (b) Denitrification: The soil contains many denitrifying bacteria like pseudomonas. The break the… nitrates and release the gaseous . nitrogen into atmosphere. 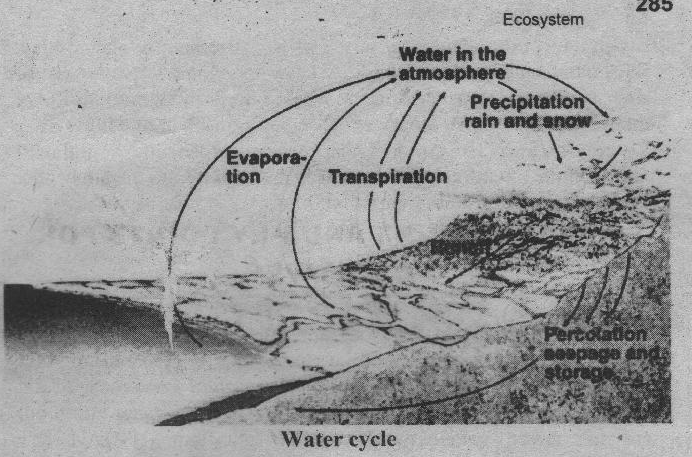 This process is known as denitrification.